При алкогольной и никотиновой зависимости, лишнего веса, стресса, депрессии, бессоннице и других проблем. 27 сентября в 15.00 в центре Линдакиви. Билеты 20 €, пенсионеры 10 €. 28 сентября в 18.00 Дворец Культуры Профсоюзов г. Симферополь. Сеанс на здоровье, любовь и удачу. Вход свободный. Групповые и индивидуальные курсы гипноза. Групповые и индивидуальные курсы обольщения. Как быть молодой, красивой и привлекательной? For 25 years Albert Stepanjan's name has caught public attention. His talent, unique abilities and excellent special education has helped many people. All began in his childhood. While swimming as a little boy in abandoned quarry, he almost drowned. In his thoughts he said farewell to his parents and friends; but some mysterious force pushed him up from bottom of quarry and he was saved. This unforgettable experience was like rebirth to him. Scientists have proven that survivors of extreme accidents and as if being borned second time, will receive new and supernatural abilities. Both of his great-grandmothers were healers and had psychic abilities. One of them was highly recognized psychic in Baku. Obviously and likely his natural talent, hereditary skills and near-death experience influenced his future career. In the end of 80's general public was very interested in healing seances, which were organized on stadions, consert halls and big auditoriums. Albert used this opportunity to work and perform. He started to tour all over former Soviet Union. Halls and stadions were sold out and he got standing ovations everywhere. He performed masterfully in psychologic tests original genre. He walked on broken glass and glowing charcoal; lyied in the air, being supported only with backs of two chairs; made broken watches and clocks tick again; bent keys and spoons in audience pockets; healed people. And those feats were demonstrated by him not only on stage, but also from distance-through radio and television. 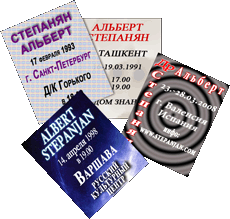 His hypnotist colleagues consider him as one of best experts in Europe and former Soviet Union. His name is well-known to parapsychologists all over the world. 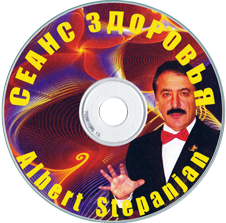 Albert de Stepanjan is his stage name.